In its third decade, the LGBT (Lesbian, Gay, Bisexual, Transgender) advocacy movement has progressed far from the days of the 1980s when gay men, transgender and lesbian women networked exclusively through the first and – at that time – the only gay magazine GAYa Nusantara. The movement is now, according to LGBT rights expert Baden Offord, facing one of the most critical periods in its development as it attempts to be more visible in the public sphere and seeks to engage more broadly with mainstream Indonesian society. 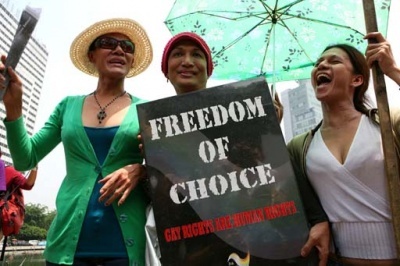 More LGBT rights groups have emerged and have been fighting for the right of sexual orientation to be acknowledged as part of Indonesia’s universal human rights. In modern urban areas, gay men and lesbian women are becoming more visible in the workplace and within friendship circles. Increasing numbers of families are becoming more accepting of their gay sons and daughters’ sexual orientation. Popular culture has also become an avenue in which the existence of homosexuality is being recognized, with breakthrough films such as Arisan (Savings Gathering) depicting scenes of gay love. A festival of films with homosexual themes, Q Film Festival, has successfully been held in the last nine years, drawing larger crowds each year. Offord, an associate professor at the Southern Cross University and author of Homosexual Rights as Human Rights: Activism in Indonesia, Singapore, and Australia, said the Indonesian LGBT rights movement was beginning to take their discussions to regional and international levels, not just keeping them in localities. But as the LGBT movement seeks more space in the public sphere, hard-line minority religious groups are showing resistance through violence and intimidation, while the state apparatus does nothing to protect the movement’s right to freedom of expression. Back in March, the police stood by and, according to the eyewitness-account of lesbian activist Rr. Sri Agustine, were even sharing rice boxes with a mob of hard-liners from the Islamic Defenders Front (FPI) who had forced their way into a Surabaya hotel, demanding participants of a planned congress on sexual orientation in the East Java city to leave the country. The hardliners told the conference organizers not to make a media statement, then vandalized GAYa Nusantara’s office, writing “ILGA = Terorist Moral” (ILGA = Moral Terrorists). Organizers of the International Gay and Lesbian Association (ILGA) Asia Conference eventually canceled the event, citing “security reasons”, after the police refused to grant them a permit, fearing protests from religious groups. Politicians and civil society organizations have quickly condemned the thuggery and police negligence as unconstitutional and violating human rights. Tom Boellstorff, author of The Gay Archipelago and professor at the department of Anthropology, University of California, said that the critical issue was the failure of the police to protect the people at the conference. in place? Will those responsible for the intimidation, particularly the FPI, be arrested or otherwise reprimanded? “If they can get away with these kinds of illegal activities, then that says something very negative and sad about the current state of democracy in Indonesia — not just for LGBT persons, but for everyone,” he said in an email interview. The police responded saying that they had not issued a permit for the event, but were obliged to be present because they acknowledged that the “fierce” objections from dozens of mass organizations may have violated the security of East Java. Indonesia’s LGBT rights champion Dede Oetomo who founded GAYa Nusantara said that LGBT activists “believed that Indonesia — with all its problems — was a democratic country, in which such conferences could be held”. He said that Surabaya, the home base of GAYa Nusantara, was chosen because there had never been any previous violent incidents like those of March, 26, when the FPI stormed the hotel. Dede, who is also a lecturer at the social and political science department of Airlangga University in Surabaya, said that Indonesian activists also wanted to show a homegrown LGBT movement to the international world. LGBT organization Arus Pelangi founder Ridho Triawan said that if local LGBT activists managed to host the fourth ILGA-Asia conference it would give bigger political power for the movement. Offord said that in the short term the LGBT movement would be chastened by the conference cancellation. “It has tested the democratic pulse of the Indonesian nation and found that the pulse is weak,” he said. In the long term, however, he thought that it will actually strengthen the LGBT movement to become a more cohesive and deliberative movement. “There will be a lot of reflection on how to negotiate the present political and social climate,” he said. By contrast, Dede thinks that GAYa Nusantara is actually becoming more cautious and low-key, because of this recent intimidation. The head of the Women Rainbow Institute (IIP) Kamilia Manaf refused to be interviewed for precisely this reason. “Activists will understand the need to ally themselves with other progressive civil society groups. They will need to understand and practice human rights, and have political awareness.” He said that the new generation of LGBT movement activists were passionate, educated and braver, however, which he finds solace in. Boellstorff said that the LGBT movement in Indonesia is flourishing but was facing many challenges, most of which have to do with the acceptance of LGBT persons in Indonesian society. “If Indonesia is truly to live up to its motto of ‘unity in diversity’, then there needs to be a national conversation regarding who is going to be included in that diversity.